Where is our Station banner at East Linton. Postcards being delivered during our 2015 campaign. Dunbar bound class 380 passing through East Linton. 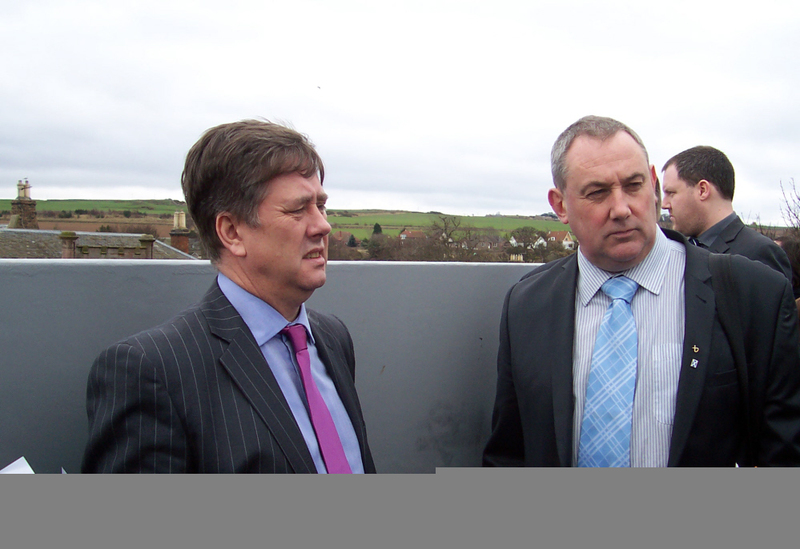 Keith Brown, MSP and Minister for Transport visiting East Linton in February 2012. Map of proposed layout of East Linton station. 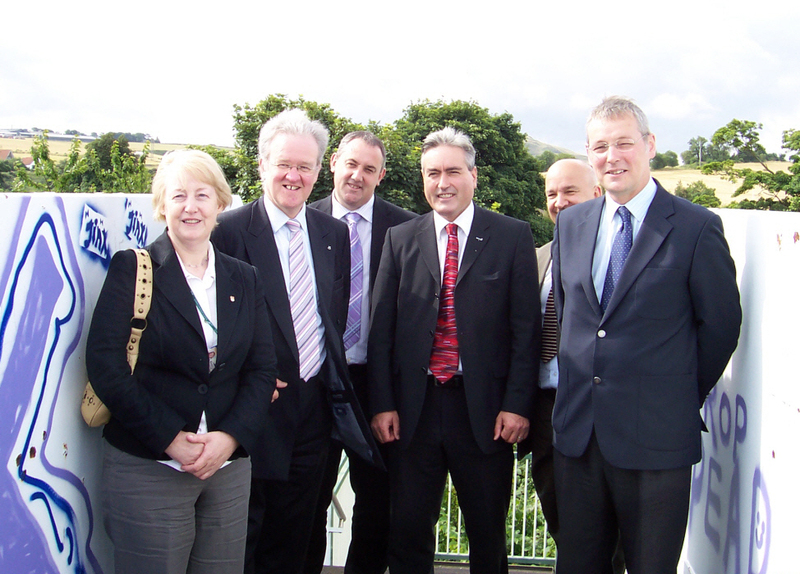 Stewart Stevenson, MSP and previous Minister for Transport visiting East Linton in August 2008. 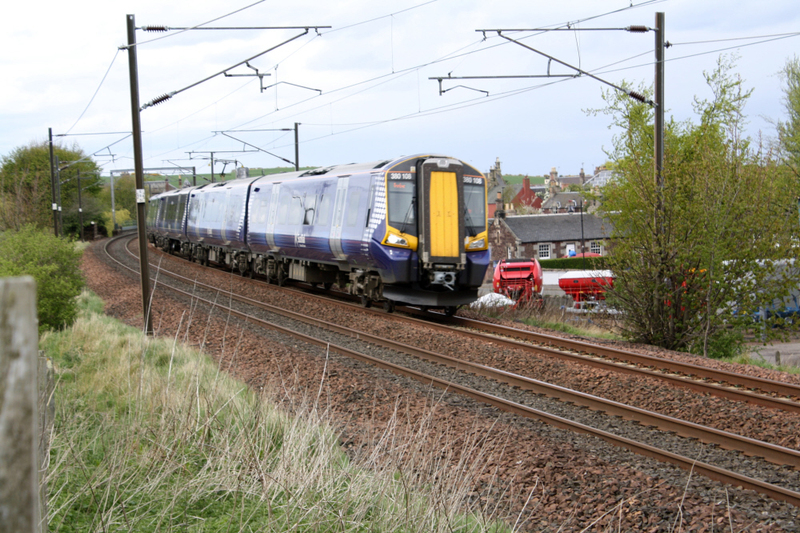 RAGES has long been pressing for the re-introduction of the local service from Edinburgh to Berwick with the possible re-opening of stations at East Linton and Reston. The main campaign story can be read at this link. RAGES were fortunate to have a meeting with the Minister for Transport, Keith Brown, MSP, in November 2011. This had mixed results, but he has promised to visit East Linton and Reston to see for himself the areas that would be served. The report on the meeting can be seen in The Rages Rag Issue 52. Since then the Minister visited East Linton, Reston and Eyemouth on 28 February 2012 where he was impressed by what he saw. A full report is in The Rages Rag Issue 53. MVA Consultancy attended a recent Dunpender Community Council meeting to hear first-hand why the local community needed a rail station at East Linton. A report can be seen in The Rages Rag Issue 55. The East Lothian Council has submitted a joint bid for funding of East Linton station from the Scottish Government's Station Investment Fund. East Lothian Council has pointed out that the small plan previously showing the proposed East Linton station had vehicle access from the north. Whilst the plan helps to explain the location generally there will not be provision for the north for vehicle drop off or the likes. Full and detailed development of the station by Network Rail will only include access road access to the station from the south. 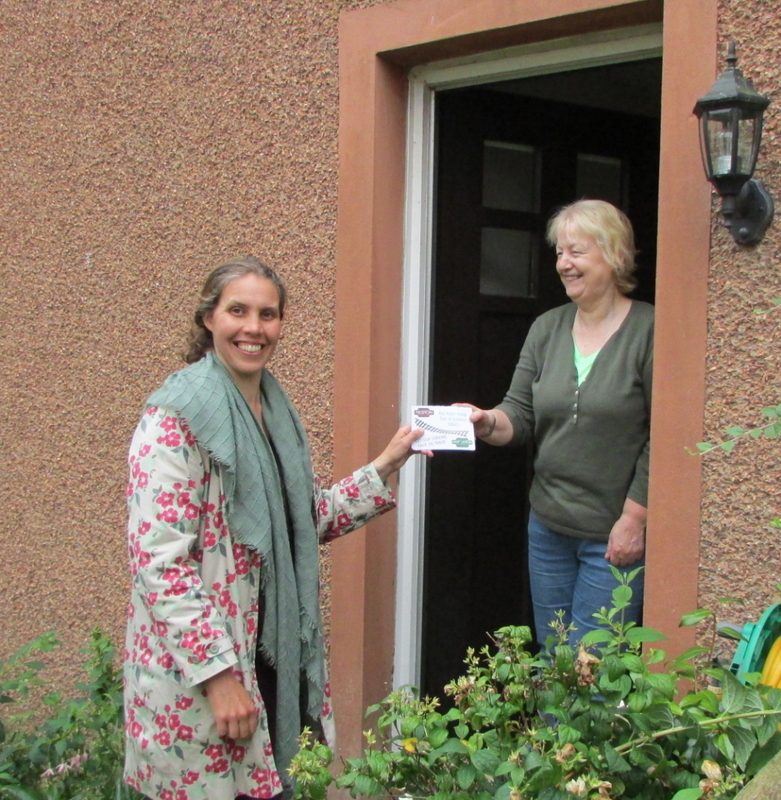 In July 2015, RAGES put postcards through East Linton letterboxes encouraging residents to send them to the Minister for Transport asking him to ensure that our local service and stations were "Kept on Track". The photograph opposite shows postcards being delivered. Progress on the re-opening of the station is exceedingly slow and progress or not can be found in the main campaign story and latest news pages. 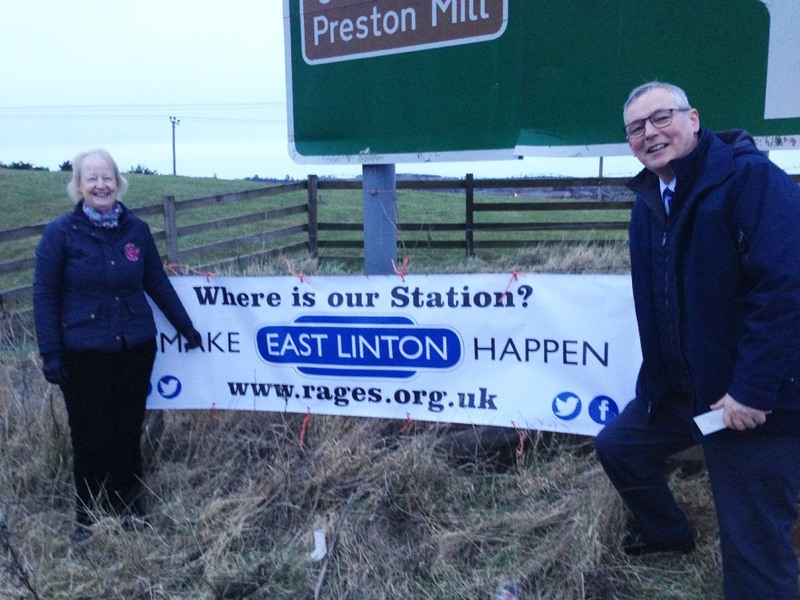 In February 2019, four banners have been erected by RAGES at East Linton highlighting the need for the station to be re-opened as soon as possible. The photograph shows Tom Thorburn and Allison Cosgrove at one of the banners. Mr Hamilton of Hamilton Farmers, East Linton, was very helpful in suggesting the best vantage positions on his fences and helped to erect them. Similar banners have been erected at Reston, the other station which RAGES is campaiging to re-open.